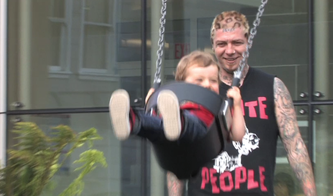 Three Words: Punk Rock Dads. Without going into any detail at all, just the idea that anyone would make a documentary film about Punk Rock Dads is so golden. I mean, seriously: taking the ultimate anti-authoritarian pop-culture figure and putting him in the position of being the iron-fisted authority in a child’s life is both wildly fascinating and unbelievably hilarious. So, convincing me to check out the new film, The Other F Word, (the “F” standing for Fatherhood) directed by Andrea Blaugrund Nevins was a total no-brainer. Because, Punk Rock Dads! The LA and Orange Country Punk Rock scene of the late 70s / early 80s was HUGE for me when I was a teenager and into my early 20s. Being aware that a number of the “kids” I grew up with in Southern California would be featured musicians in the film, I knew this would be an enjoyable viewing experience, but honestly, I had no idea what I was in for. 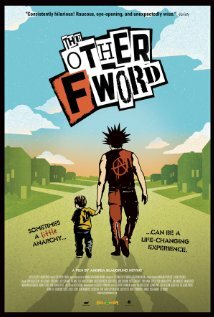 As riveting as any scripted drama, unbelievably funny and deeply – often unexpectedly – emotionally gut wrenching, The Other F Word is one of the best movies of 2011 and is way up there on my top 10 list of best music documentaries I’ve seen. I just loved this movie so much and can’t recommend it highly enough. Blaugrund Nevins interviewed about two dozen Punk Dads for the film, and she got a really good mix, but the ones that get the most screen time are Pennywise frontman Jim Lindberg (whom I’d call the “star” of the film), Art Alexakis (Everclear), Fat Mike (NOFX), Lars Frederiksen (Rancid), Mark Hoppus (Blink 182), Ron Reyes (Black Flag), Flea (Red Hot Chili Peppers), Pro-Skating legend Tony Hawk, Drummer Josh Freese and Tony Brandenburg (The Adolescents). All of these guys are clearly just in love with being Dads and are entirely devoted to their children, who range in age from infants to grown teenagers. The guys come off as being really cool people in addition to being great Dads, and a lot of candid and funny moments got captured on film. In addition to the many scenes of these guys interacting with their children and relating hilarious anecdotes about their personal experiences with parenthood, the film spends an entire section discussing what it’s like to be a working musician whose band’s financial success is the basis of how they put food on the table. With the possible exception of Flea, Josh Freese or Mark from Blink 182, who probably never have to work a day job again if they don’t want to, none of these guys are in millionaire Rock Star bands, but rather are working-class musicians who must tour up to 300 or more days per year to support their families. It’s surprising how many of the guys featured in the film admit that they never got into music to make money, but now, 20 years into it they’ve managed to earn a steady and viable income playing punk rock music. Like the story of the Golden Handcuffs, the downside to “realizing the dream” while making a living in a changing musical environment is that it requires them to be away from their kids for such a major part of the year that they miss out on first days of school, ball games and birthdays. Many wonder aloud in this film if it is worth it. One, ultimately, decides that it is not. You may still be able to find The Other F Word showing at a theater near you (visit This Link for theater engagements), but if you’ve already missed out on seeing it on the big screen, the film will be released on DVD and Blu-Ray on January 31st, and is well worth owning. Executive Produced by Morgan Spurlock and Jeremy Chilnick, The Other F Word will appeal to music fans – and fans of these featured bands in particular – cool parents and anyone who loves a good documentary film. The Worley Gig Gives The Other F Word Five Out of Five Stars!! Watch the Trailer Below!